Standard UK Delivery is free on all orders exceeding £100 + VAT. Orders below this threshold will be charged a standard £4.95 + VAT delivery charge*. Express UK Delivery is charged at a standard £8.95 + VAT **. The default overseas delivery charge is £15 (+ VAT where VAT applies). This is on a Price on Application (POA) basis. Should your order be large in volume or heavy in weight, we will get you the cheapest possible delivery quote from a range of international freight couriers and confirm with you before processing the order or taking any money. Should you be satisfied with the cheapest delivery quote, we can then proceed with your order. In the UK we strive to send your order to you within 5 working days and overseas 30 days. Should you require goods urgently please contact us prior to ordering to check stock and delivery options. We normally strive to send orders out in five days from receipt of order, some items may be deemed special, this means that we may not carry them as a general stock item. We will always inform you by mail as to what is happening with your order, until you receive the order. Some large items and mass quantities can weigh a lot and/or exceed expected dimensions, but as a general rule of thumb we can ship up to 10 Kilos within the UK for no more than £10.00 + VAT. Overseas Customers may check with us prior to shipment of any goods. But if there is no communication we will always delivery the most economical way, over speed. and charge accordingly. Please be aware that your country may apply import taxes or customs charges to release your goods. 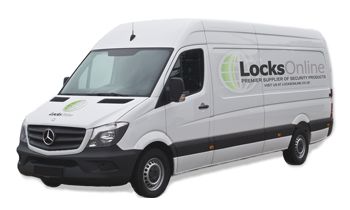 This is not included in our shipping quotes and any taxation or charges enforced by customs is the responsibility of the recipient and not LocksOnline. Any shortages, errors or concerns with your delivery must be reported within 2 days from receipt of the goods in writing or email. In some instances goods are sent direct from the manufacture. * Excludes large / bulky items. Standard delivery for large/bulky items starts at £8.95 + VAT. ** Not available on all items. Some items may take longer as we must order them in specially.